This looks retarded. It looks confusing and unproductive. It looks like its made for tablets or smartphones or something. But no tablet or smartphone runs GNOME. I am not sure GNOME has any UI/UX experts. It seems that they got some anti-experts, actually. Damn I used to like GNOME. Do you get the basic idea of GUIs? They should simplify (no, I don't mean in the GNOME moron way) actions you'd normally need to use your keyboard for, even if only out of ergonomy. Do you use shortcuts to go forth and back in firefox? Well I don't care because 99% of the people do so. Sometimes I am just to lazy to use my keyboard and just use some of the luxury of our modern technology. And don't tell me lazyness isn't an attitude of the human kind. Our lazyness lets us develope new technologies for our ease of use. You don't need buttons? Screw it! go back to stone age and use your Linux in text mode! I'm all for it, but the GNOME way is just not making any sense. They simplify by making logical actions complicated - well it's their ALIEN way of understanding "simplifying". Last edited by Nuc!eoN; 01-13-2014, 07:07 PM. Do you use shortcuts to go forth and back in firefox? Well I don't care because 99% of the people do so. Oops sorry I meant that 99% of the users use the buttons. You don't use keyboard shortcuts? I use keyboard shortcuts pretty often but a GUI shouldn't need to rely on "hidden" keyboard shortcuts to be productive. This defeats the purpose of having a GUI in the first place. Don't get me wrong, I'm not against keyboard shortcuts at all. It is just that a good GUI should provide productive paths for both usage paradigms. I think most people use some shortcuts for text editors. C-c C-v C-x C-s i s very common even many people without much computer experience use them. The point of this is unification an following their HIG. I think there are a few issues with their idea but in general I really like the new approach. Is that really "cluttered"? The space of a text document in the window is literally around 90% as much space allocated as in this new gedit, but I have dozens of other circumstantial tools to use that, while plugins, are at my fingertips. 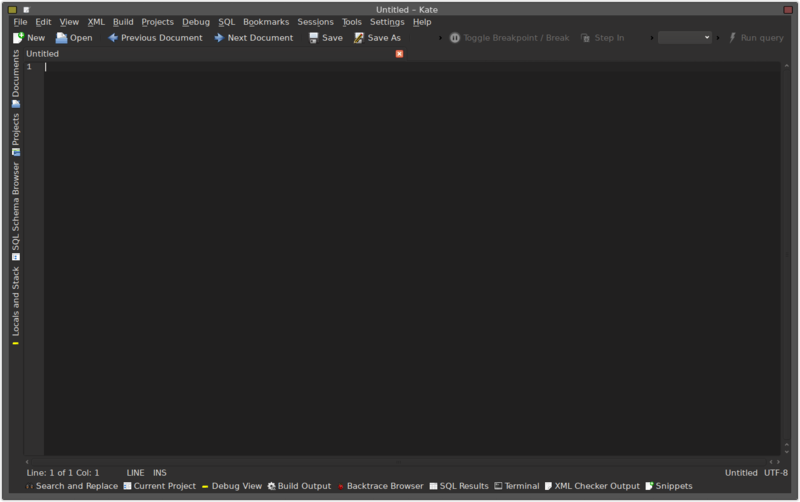 And if I used the menu-in-the-title-bar KDE option I'd have some more space back.